I am always keen to recycle anything and everything. I'd be sick and very pissy ! So, when friends need 'something', albeit a screw of a certain size or a piece of wood, or a plant pot - they know where to come. Needless to say I have barns, stables and bedrooms full of incredibly useful 'stuff'. 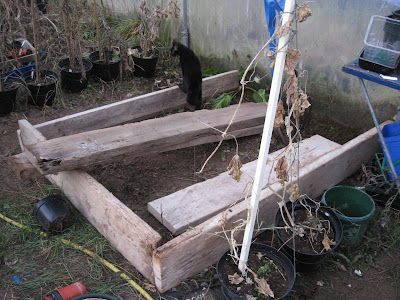 My friend John is building these permanent raised beds in my polytunnel, so that I don't have to fill endless pots of compost every spring for my tomatoes, basil and cucumbers etc. I can't wait, it's going to be wonderful. Especially as he is building them totally from the useful junk I have been collecting over the last goodness knows how many years.